RedStuff ceramic brake pads, passenger car/saloon car pad NOT made for Truck or SUV fitments. EBC lowest dust fast street pad with 15% brake improvement. Superb material for Prestige imports/European and Asian cars. 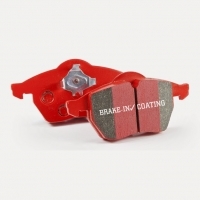 Features red ‘brake in’ surface coating for instant safe braking after install. For more information about this product please call 1-888-51BRAKE(1-888-512-7253) and one of our sales representatives will be happy to assist you.